Ho'oulu ka 'Ulu—Revitalizing Breadfruit was established in 2010 to revitalize breadfruit as an attractive, delicious, nutritious, abundant, affordable, and culturally appropriate food. Ho'oulu ka 'Ulu is a project of the Hawaii Homegrown Food Network and the Breadfruit Institute of the National Tropical Botanical Gardens. Anything you can do with potato, you can do with breadfruit...better. Professional development workshops presented with support from Western SARE for agricultural professionals, growers, entrepreneurs, policymakers, educators, and extension agents. 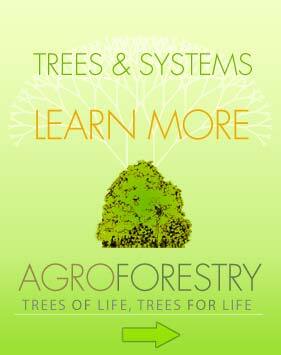 Workshop participants will learn how to design, establish, and maintain agroforestry systems that include breadfruit. Growing several crops together in agroforestry can improve overall production, increase yields and profits, and reduce the risks of weather extremes. Hands-on exercises during the workshop will prepare participants to apply new skills in planning using methods developed by the workshop presenters. Participants will also learn about creating dishes and products with breadfruit and other crops grown together with breadfruit. Craig Elevitch (Agroforestry Net), Jim Currie (Pacific Agricultural Extension), Nat Tuivavalagi (Pohnpei), Aunty Shirley Kauhaihao (Hawaii Homegrown Food Network), and special guest presenters at every workshop location. 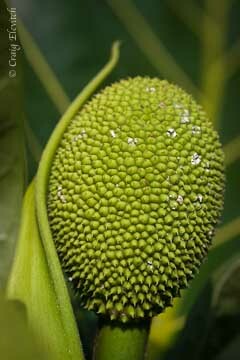 Breadfruit has been cultivated by people for thousands of years in highly productive plantings together with numerous other crops. Written for commercial and home growers looking to combine modern horticultural techniques with traditional growing methods similar to those successfully employed by Pacific Islanders over many centuries, this groundbreaking guide is being released as the prolific Pacific Island staple breadfruit enjoys a resurgence in planting and growing across Hawai‘i and around the tropical world. With its high nutritional value, gluten-free status, and moderate glycemic index, breadfruit (called ‘ulu in Hawaiian) can be prepared similarly to a potato or sweet potato but has greater versatility and qualities well suited for main dishes, desserts, baked goods, and even beverages. Breadfruit trees are abundant producers and require far less labor compared with other starchy crops such as taro and sweet potato. Breadfruit Agroforestry Guide presents techniques that can sustain productivity for long periods of time, while regenerating land degraded by erosion, compaction, overgrazing, and loss of organic matter. It covers subjects that include recognizing breadfruit varieties; agroforest planning, planting, and maintenance; selection of suitable accompanying crops; value-added products; and economic evaluation. The guide provides a range of growing scenarios from backyard gardens to large farms in the tropics. The guide was developed with funding by Patagonia Provisions®, the State of Hawai‘i Department of Agriculture, Western Sustainable Agriculture Research and Education (WSARE), the Kaua‘i County Office of Economic Development and published by the Breadfruit Institute of the National Tropical Botanical Garden, Kalāheo, Kauai, and Permanent Agriculture Resources, Hōlualoa, Hawai‘i. 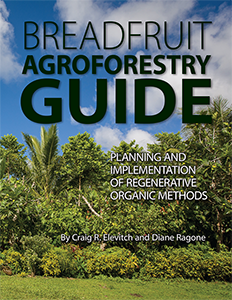 Using detailed design examples, species tables, and design descriptions and over 100 photos and illustrations, this book breaks new ground in showing growers how to plan and implement agroforestry that emphasizes breadfruit production. In so doing, growers can design their production to be resilient to changes in weather and market prices—and build a stronger local food system in the process. Download the free web pdf edition (PDF file, 7MB). Hard copies can also be purchased from online retailers such as Amazon.com. Breadfruit tastes fantastic mashed, in salads, made into chips and french fries, and in countless other dishes where you can use potato. In Hawai‘i, breadfruit is the obvious choice over potato. It's grown locally and supports local farmers. It's more nutritious than potato. 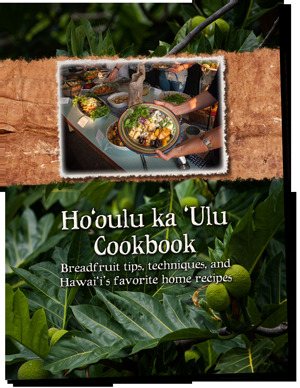 Order the Ho'oulu ka 'Ulu Cookbook for some of the best recipes from Hawaii. Download guides for farmers, cooks, and consumers. 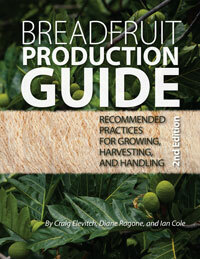 Grow, prepare, and eat breadfruit like a pro! 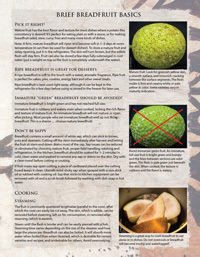 The Ho'oulu breadfruit cookbook: Learn how to pick or buy fruit, cook, and prepare wonderful breadfruit dishes! This new cookbook is essential for both novice and expert breadfruit cooks. It covers how to select fruit that will have the best taste and texture for the dish you are preparing. Then it covers the most important ways to cook breadfruit to eat plain (like potato) or use in various recipes. Finally, it presents 20 recipes selected from the last 25 years of breadfruit cookoffs and cooking contests in Hawai'i, allowing you to pick a dish perfect for any occassion. Your purchase helps support the Ho‘oulu ka 'Ulu—Revitalizing Breadfruit project. Order the book now from Amazon.com. It is well known that Hawai'i imports about 90% of its food, making it one of the most food insecure states in the nation. Additionally, since the economic downturn of 2008, many families lack access to affordable and nutritious food. We believe that breadfruit is a key to solving Hawaii's food security problems. Breadfruit is nutritionally and culturally important throughout the Pacific- for Hawaiians and the thousands of non-Hawaiian Pacific islanders who make Hawai'i their home. The beautiful breadfruit tree plays a major role in the spiritual and cultural life of Hawaiians and it was a key staple food and a source of wood, craft materials and medicine. For hundreds of years before Western contact, traditional Hawaiian breadfruit groves were capable of providing the food value to sustain at least 75,000 people. Today, few of these trees remain. Any serious conversation about food self-sufficiency and nutrition in Hawai'i should include plans to efficiently utilize the 'ulu trees that remain, to revitalize 'ulu by planting more trees together with their associated food crops, and educating about 'ulu cultivation and uses. Simulation of Kona kaluulu region prior to Western contact. The kaluulu region is estimated to have produced 36,000 tons (72,000,000 lb) of breadfruit per year. 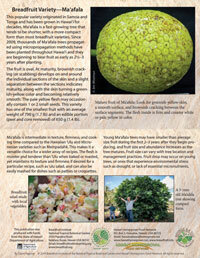 Revitalizing breadfruit in Hawai'i requires a multi-pronged approach. Ho'oulu ka 'Ulu is currently developing a variety of projects in the following priority areas. Tell the Story of the Culture and History of 'Ulu in Hawai'i: Tell the story of Hawai'i Island's long history with 'ulu with the intention of building upon this history to bring 'ulu back into common use. The first breadfruit festival (Breadfruit Festival 2011) was held on September 24, 2011 at Amy B.H. Greenwell Ethnobotanical Garden in South Kona. Four additional Ho'oulu ka 'Ulu festivals were held on Hawai'i Island and Kaua'i. Create an Inventory of Existing Trees: Create an inventory of existing trees, including locations, uses, productivity, number of trees and species. This information will be used to increase knowledge about 'ulu field systems, preserve existing trees, determine quantity and feasibility of making the fruit available for distribution, determine which varieties work best in which locations, and determine location and varieties for new plantings. Research: Conduct and support research on adaptability of key varieties, effect on soils over time, the environmental history of the kalu 'ulu zone and productivity of a mixed agroforestry system. Increase Island-Wide Breadfruit Population: Increase island-wide planting of 'ulu in the community by increasing access to a diversity of breadfruit varieties through community planting projects and outreach to the public, community groups and schools. Increase Island-Wide Planting of 'Ulu—Develop as a Commercial Crop: To take 'ulu from being an underutilized resource to becoming a profitable crop by determining the most productive varieties, developing management practices, increasing the variety of plants available, increasing accessibility to plants, and developing outreach materials to support the commercial production of breadfruit. To simultaneously develop commercial farms, distribution systems and the market. Agroforestry – Agroforestation: Utilizing the Hawaiian/Polynesian style agricultural system of mixed agroforests ('ulu, sweet potato, banana, taro) to restore the kalu 'ulu zone, other historical 'ulu groves, denuded agricultural land and demonstation agroforests. 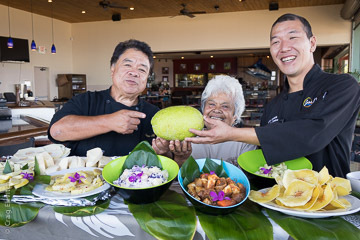 Public Education to Restore 'Ulu as a Key Component in the Local Diet: To reintroduce 'ulu as an attractive, delicious, nutritious, abundant, affordable, and culturally appropriate food. To reinstate 'ulu as a staple food in Hawai'i again as a regular and enjoyable part of the local palate, along with taro and sweet potato. To foster appreciation of the trees and fruits as assets in the garden. Engage Pacific Islanders: To engage Hawaiian and Pacific islander communities who have a current cultural context and taste for breadfruit in all aspects of the project. Elements of Market Creation: Simultaneous to cultivating farmers, a comprehensive market development plan will be implemented to develop the commercial market for breadfruit both inside and outside Hawaii. Food Security and Alleviating Hunger: Of primary importance to both market development and food security is the harvesting of existing breadfruit to be distributed to markets and the food insecure. The development of animal feeds from local inputs is also critical to future food security in Hawaii. Increase Access to Nutritious Food: Promote 'ulu and associated Hawaiian crops as elements of a healthy, affordable, culturally appropriate diet that helps address the root causes of obesity and related disease. Youth Engagement: To engage the youth in propagating, planting, harvesting and preparing 'ulu; as a physical activity, agricultural training, to increase nutrition, access to food and to develop a familiarity with the breadfruit as food. 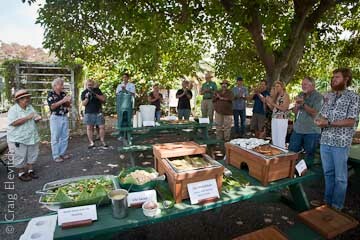 Ho'oulu ka 'Ulu planning committee enjoys an all-'ulu lunch prepared by the Culinary School at UH West Hawai'i. The Ho'oulu ka 'Ulu Planning Committee is comprised of 20 key stakeholders representing 16 Hawai'i nonprofit, university, and government organizations.